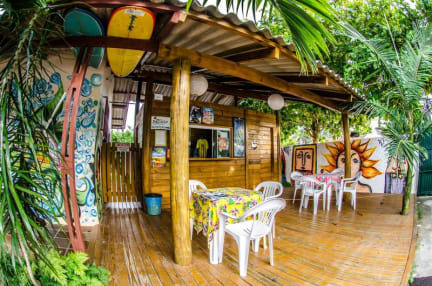 If you like the beach, this hostel is perfect. Very close, very chill, perfect if you just want to relax. Beers and Caipirinhas are cheap which you can buy at the hostel. Everyone who stays here shares the same vibe, and Campeche beach is super nice. Super clean, very relaxed vibe, and all staff are super friendly. This location is in such a relaxed part of the island and a 2 minute walk to the beach. Great vibes and really comfortable bed. Best hostel i've ever stayed, such great atmosphere! Truly reccomend this place. Friendly staff, a relaxed atmosphere, sociable dorms and a lovely common area / kitchen. It's 1 minute away from the beach by foot and 5-10 minutes away from some lovely restaurants. Minor criticism would be security (there isn't any) but due to the location, this isn't a big deal. I enjoyed my stay here! Thanks! A great choice if you are looking for a sociable yet relaxed atmosphere close to the beach. Really nice hostel at the campeche beach only negative aspects that the next big supermarket ist a 25 min walk away and the kitchen is a bit dirty. But the hostel is really beautiful and the staff super friendly! 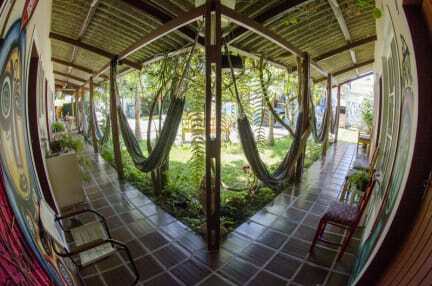 Great hostel with loads of hammocks to relax in. All the staff were very friendly and helpful if need you needed anything. Would definitely recommend staying here. Only issue we had was when we asked to rent surf boards they seemed quite reluctant even though they are a surf hostel. We were strictly told if we broke a board we would pay for a brand new one. Came across as if they were trying to put us off. Other than that it was a really enjoyable stay. If the weather is good then staying at this hostel near the beach (behind the sand dunes) could be fun. But for me it rained and the long walk into the town was tedious. Fairly disappointed by this hostel to be honest, but it’s great if you want to be near the beach & not much else. Rooms & bathrooms were clean but kitchen not so much. Expensive for what it is & far away so not ideal. Nice chill area/hammocks/ sofas etc. Some of the staff were super but others had bad vibes. Wouldn’t really recommend to be honest.